Vaux?s swift (Chaetura vauxi) is yellow listed (not at risk) in British Columbia. At dusk they gather in the darkening skies, wheeling around for 20 or 30 minutes before swooping dramatically into a brick chimney or hollow tree trunk. Occurs throughout south and central B.C. also on the northwest coast of B.C. Nests and roosts in hollow trees in mature forests. Forages often at rivers and wetlands. Also forages at higher altitudes over a wide variety of habitats. Often roosts in large flocks in hollow trees or chimneys during spring and fall migration. Towns with older houses and historic buildings are most likely to support nesting birds. 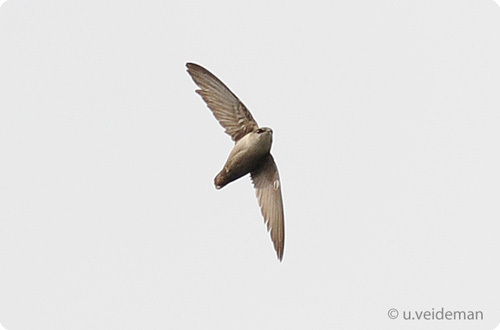 For more information on this species, visit The BC Species and Ecosystem Explorer and enter "Vaux?s swift" in the species Name field.